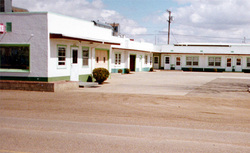 The Bear Paw Court Motel and RV Park is open year round. There are 16 units, both doubles and singles. All of the units are at ground level with ample parking space. All units are large modern rooms with TV, air conditioning, phone service and computer ports. The units have queen size beds and a bathroom. The double units are two rooms with queen size beds in each room and a bathroom. Our priorities are clean, comfortable lodging at affordable prices. Pets are allowed but there is a $5.00 per night fee. Directions: The Bear Paw Court Motel is located on the south side of Highway 2 in Chinook, Montana. Watch for the sign with the Friendly Bear. The road going past the motel goes south to the Chief Joseph Battlefield and the Bear Paw Mountain.